The new Advanced Multiphase Ugrade Kit for the SP PRO inverter allows for improved performance, increased flexibility, quicker installation and set-up time. The upgrade kit includes the Communications Cards, cables and must be used with SP PRO firmware version 11.00 or higher. Set-up and configuration time is reduced using the installation wizard in the SP LINK software. The new operation method means that shunts and complicated control wiring are no longer required, therefore reducing installation time. Just a single cat5 cable links each SP PRO. 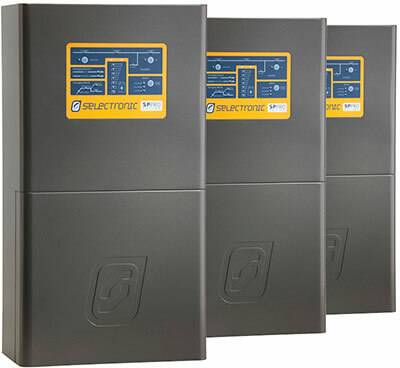 SP PRO inverters in a multi-phase installation no longer have to be set-up and configured individually; the new Advanced Multphase upgrade kit now has true primary-secondary operation allowing the inverters to work as one ‘brain’ with multiple ‘hearts’. The Select.live remote monitoring solution is compatible, with only one unit needed to provide a performance summary of multi-phase systems. Advanced Multi-Phase operation allows for balanced generator loading across each phase and is compatible with our Grid Fail Generator Backup kits (on 24V and 48V models). The new SelectSun 3 Phase Grid-Tie inverter is also compatible with Advanced Multiphase. The Comms Cards provided in the upgrade kit are ‘future-ready’ for increased capabilities in paralleling, advanced micro-grids and managed batteries. A number of Approved Managed Batteries are compatible with Advanced Multiphase operation. For Advanced Multiphase operation, you need SP LINK version 11 and SP PRO firmware 11. Refer to the SP LINK page for more details..